Josiah has been with us since January of 2016, but he has also been a licensed pilot since he was 18 (he’s now 20). He became interested in aviation at about 8 years old through a program called Young Eagles in which volunteers give free flights to kids and actually let them fly the plane! He began learning to fly gliders when he was 14 and he earned his pilot’s license at 16. 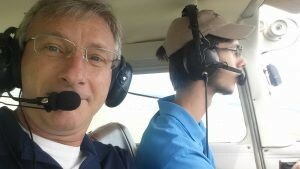 After that, he moved on to learning to fly powered airplanes and earned his certificate for that last year. His interest in aviation doesn’t just include flying the planes. He is also a volunteer and an instructor for a non-profit organization called Aviation Education Foundation of Colorado (AEFCO). As it states on their website, “The mission of (AEFCO) is to provide aviation education programs for local young people that promote an awareness of careers in professional aviation and aerospace fields.” The aviation industry is beginning to see a sharp decline in the number of professional pilots, so AEFCO, and other organizations are working diligently to prepare and qualify young people, ages 15 – 19, for careers in those areas. AEFCO accomplishes their goal with a FREE10-day intensive program in the summer and also a FREE 6-month long program in the fall and winter. You read that right… what they offer to these young people is FREE! In the summer “camp” the students spend their time learning the materials to prepare for the written exam for pilots. To become a pilot, a person must pass a written exam, an oral exam, and a “check-ride” with an instructor. Attending the summer camp enables the students to work toward completing the first step toward becoming a pilot. Some of them even get flight time with an instructor during the camp. Josiah has been an instructor for AEFCO for the last 2 years, but he’s no sophomore, having been involved with AEFCO in some capacity since 2011. This fall he becomes the Chair of the Pilot Prep Course. Currently, in addition to being the office administrator/manager for Homestead Roofing, Josiah also is a full-time student at Pikes Peak Community College and plans to transfer to UCCS in pursuit of a BS in Mathematics. After college, his aspiration is to enter the field of aviation education in some capacity, but he still plans to continue with his role at AEFCO as well. Josiah started working for Homestead Roofing because of timing. He was ready to start college but needed a flexible work schedule. He had been working at Freeflights Composites, a company that designs, repairs, and builds composite aircraft at Meadowlake Airport, but his expected work-load at college meant that he wouldn’t be able to put in the time necessary at Freeflights. stage of progress and Josiah has the task of freeing up the rest of us so we can concentrate on making sure our clients’ experience is the best possible and that our jobs are done with excellent quality. Josiah quickly outgrew being just the office administrator and developed that position into the office manager position. Basically, he runs the place. He even gets to tell me (his dad) how things need to be done (sometimes! :-). Without his initiative and ability to put things into processes and systems, considering how busy we have been this year, I don’t see how we could be successful running our projects for our clients. Josiah is also the one you may reach if you call our main phone number, so he will gather your information and pass it on to the project manager you have worked with in the past. Josiah is a huge asset to our company. He moves behind the scenes but moves the scenes that he’s behind.